Candles are the scent soundtrack to my life. A bit dramatic, I know. I just can't get enough. I've got different candles for different seasons and always have a few perennial favorites around the house. At the beginning of summer I go cuckoo for coconut. My house is a tropical oasis. Towards the end of July, it's time to start the transition into more bold fall scents. I simply cannot ABIDE pumpkin and food scented candles (with the exception of the occasional vanilla hybrid scent)- so I tend to gravitate toward woodsy, herbal and floral scents. 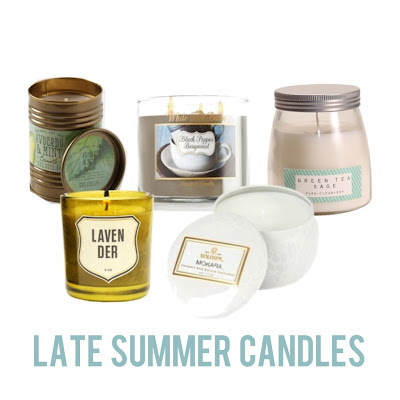 It's now late July and save for my Capri Blue Mango Mandarin candle, I've finally burned through all my stock (including what was left over from LAST summer) and I've put an embargo buying anymore tropical candles until next year. A girl's gotta have something to look forward to, no? Anticipation is one of life's simple joys. Illume Good Nature, Avocado & Mint (Anthropologie): Recommended by a my friend Sara, this little guy is very fresh and subtle. Great for kitchens and small rooms. Bath & Body Works, Black Peper Bergamont (Bath & Body Works): A bit more on the spicy side, but still balanced, fresh and slightly masculine. Pure. Clean. Soy, Green Tea Sage (Target): My friend Chris had this one going at her place the other day, it's a clean and uplifting scent great or large rooms. Izola, Lavender (West Elm): I have almost bought this candle at least five times, a beautiful single-note lavender that is really good for any space. Voluspa, Mokara (Anthropologie): A soft floral option that I find myself going to when transitioning from spring to summer as well.